Pond landscaping or a water garden can be the focal point a whole backyard landscape to be based on, and fun activity enjoyed by young and old. A small patio, townhouse gardens or a large backyard, landscaping ponds or building a water garden can be a fun landscaping project for almost anyone. 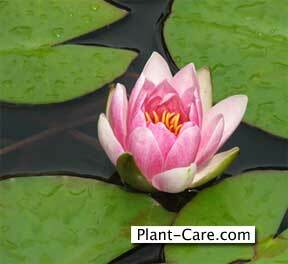 Many discover water gardening and water lilies actually require a minimum of work. Once your pool, small pond or water garden is established… about all that is required is to add water to replace evaporation if there isn’t enough rain. You may need to pull out an occasional leaf when it gets too old. The sound of water, adding koi fish, water lilies and other plants adds a dramatic and calming affect. A glimpse of our watergarden pool never fails to provoke gasps of “Ohs” and “Ahs” from visitors and family as the flowers look as if they are floating on air. It does not matter the type of water landscape or water feature you add, you should attempt to make the installation as natural looking it can be – like it’s always been there. However, make it personal by adding unusual garden ornaments to make it unique. If the final result has key elements are missing or looks unnatural, you’ll never be happy with the final product. If you do it yourself, you’ll experience a huge sense of fulfillment. Especially, when you sit and admire, a waterfall made of natural stone, a pond teeming with fish and experience tranquility. Be realistic here. Your budget needs to be considered right up front. If you don’t keep an eye on it it can get out of hand very fast! You don’t want to get to the halfway point and know you can’t complete the project because of the lack of funds. 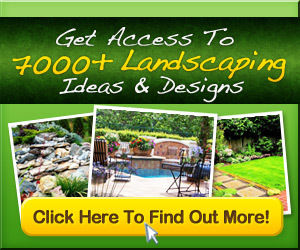 Many times in landscape projects, people wish they had a a bigger budget. If you start with a good basic foundation you can always improve as time goes by. If you want a great looking waterfall, pond or water garden – be realistic on your budget and do some planning before you purchase anything! As in any building project the toughest decision is making the deciding what you want the end result to look like. Many times the project outcome relates directly to what materials you purchase. Before you run off buy a backyard pond kit containing all the required supplies or to the local plumbing supply to purchase pumps, filters and liners, do some front end planning. Some very important options must be considered before you begin the digging process. Finding the right location is the most important thing. What is my goal? 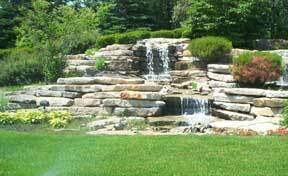 What exactly do you want this water feature – pond, waterfall, water garden or combination to accomplish? Do you want a backyard pond design that includes a pond full of Koi swimming around, enjoy the sound of a waterfall quietly rolling down the rocks splashing into the pond, or an addition to the pool area or a combination of each. In choosing a site, look for one with at least four to six hours of sunlight each day. Most of the plants you’ll use in your water landscape will require full sun. You also want the pond to be away from trees, eliminating leaves and debris. Pick a location that does not interfere with electrical sources. When deciding on the location of your pond, make sure you choose a site viewable from the inside your home. This is so that you can enjoy your creation from indoors or outdoors. Ours is not a showplace for fancy fountains and waterfalls, but for the simple pure pleasure pond landscaping can bring us. No matter how many times I walk by, I always stop for just a moment and feast my eyes on its beauty. A part of any pond landscape design, shape must be considered. Make sure the watergarden will fit in your space and suit your personality. If you are after a formal look, rectangular and square are best. Unusual shapes and curving are for more informal looks. When your pond installation is finished, it’s time to decide what you are going to do around it. There are numerous ways to “style” your pond. Choose from brick or stone…. even line the pond with flowers. It all comes down to the look you want to achieve. I might add, we keep several chairs lined up on the grass around the pond. If summer heat and fighting weeds is getting you down, pick a comfortable chair, and enjoy gardening the easy way. A fountain, plants and fish are excellent pond additions to add a soothing and attractive look and make it your own. Do not overload your pond with too plants or fish. Water plants can grow and spread quickly and fish will most likely multiply. A water garden or pond can be a big project, but with planning and help, it is worth all the hard work. It’s a landscape feature you can enjoy for many years.